Programs can be completed in one year or less. Think about how fast a year goes by?! You could be starting a new, fulfilling career in no time. You meet amazing people. 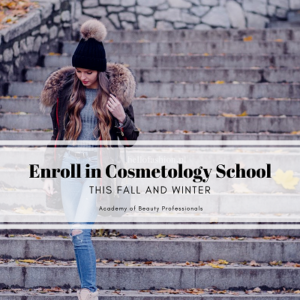 When you start your journey in cosmetology school, you not only develop a great relationship with fellow classmates, educators, and clients – there is an entire network of people you begin to meet in the beauty industry. We have guest speakers come in from local salons. Often times, salons reach out to us with job opportunities for our students. It is not uncommon for students to already have jobs lined up prior to graduation. Educators want you to succeed. Cosmetology school differs from traditional school in that we offer a small student to instructor ratio. This means our educators can give their full attention to our students in order to help them be successful. It can be a difficult, but exciting goodbye when our students graduate! At the end of the day, our instructors have a great deal of experience in the beauty industry and want our ABP graduates to be well-prepared, and employed by the time they graduate. Get ready to start your new adventure this fall or winter! We have classes starting soon. Connect with us to find out start dates, program details, and financial aid assistance that may be available to you.